OTTAWA — The family of an Afghan war veteran who shot and killed his mother, wife and daughter before taking his own life earlier this year has taken their call for an inquiry to the steps of Parliament Hill. The Desmond family was thrust into the national spotlight in January when Lionel Desmond fatally shot his mother Brenda, his wife Shanna and their 10-year-daughter Aaliyah in their rural Nova Scotia home. Relatives have said the former infantryman, who served two tours in Afghanistan, did not get the help he needed to deal with PTSD after he was forced from the military for medical reasons in 2015. 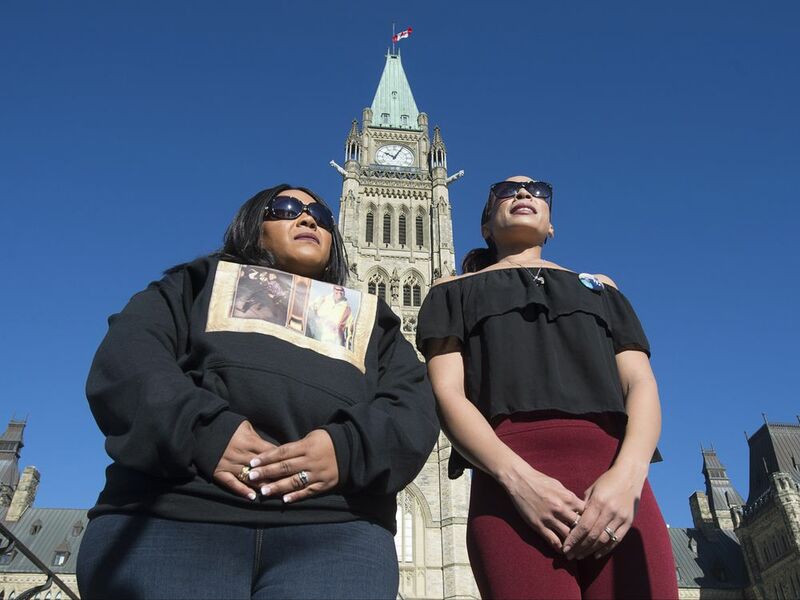 His sisters, Cassandra and Diane Desmond spoke in front of Centre Block on Friday. Cassandra said the family is still waiting to hear whether Nova Scotia’s medical examiner will recommend a provincial inquiry. But she wants answers from the Department of National Defence and Veterans Affairs Canada about the treatment and support her brother received, or didn’t receive, to ensure others don’t suffer the same fate. “We do have the right to know exactly what happened to Lionel Ambrose Desmond,” she said. Veterans Affairs Minister Seamus O’Regan was expected to meet the family on Friday, after offering them his condolences in the House of Commons and asserting that one suicide is too many. But federal officials insisted the decision on whether to call an inquiry rests solely with the Nova Scotia medical examiner’s office, which confirmed that it was still weighing the decision. “With respect to an inquiry, the provincial medical examiner would be able to conduct a fatality inquiry under the laws of Nova Scotia,” O’Regan’s spokesman Alex Wellstead said in an email. Wellstead did reveal that Veterans Affairs has conducted its own internal review of the case, but he said the results have not been made public because of privacy concerns. The family’s renewed calls for an inquiry come only two weeks after the federal government released a suicide prevention strategy aimed specifically at current and retired military personnel. More than 130 serving military personnel have taken their own lives since 2010, according to National Defence, while the number of veterans who have killed themselves isn’t known. Cassandra Desmond said the strategy looks good on paper and might have even saved her brother. Among those appearing with the Desmonds on Parliament Hill were several people advocating for the Canadian military to stop using the anti-malarial drug mefloquine, which some experts have linked to brain damage. Cassandra Desmond said her family has not been able to obtain her brother’s military medical records, but they have received anecdotal reports from fellow soldiers that he used mefloquine in Afghanistan. The Canadian Forces recently changed its policy so that other anti-malarial drugs are offered first, but critics want it banned entirely from military use. Cassandra Desmond said she fears mefloquine was somehow connected to what happened to her brother, which was why she was joining her voice to those calling for an end to its use.